Wet rooms do away with bulky and restrictive shower trays and cubicles to create a fully waterproof walk-in shower area. They are very easy to install, either as a stand-alone room, or as part of an existing bathroom with a shower screen if necessary. Owing to their practicality, ease of access and low maintenance upkeep, wet rooms are becoming increasingly popular within modern homes and are an excellent way to add value to your property. With S&G Carpets, creating your very own stylish wet room couldn’t be easier – we stock a vast array of waterproof, non-slip antibacterial flooring to ceate a safe and a fully watertight open shower area. Our experienced team can provide a professional fitting service to ensure that your flooring is layed properly, and that the surface is 100% watertight. Alternatively, we will be happy to provide you with expert help and advice for preparing and installing your own wetroom flooring. Providing high quality products to all of our customers is of high importance to us here at S&G Carpets. For this reason, we only stock products that have been tried and tested for manufacturing products of excellency. 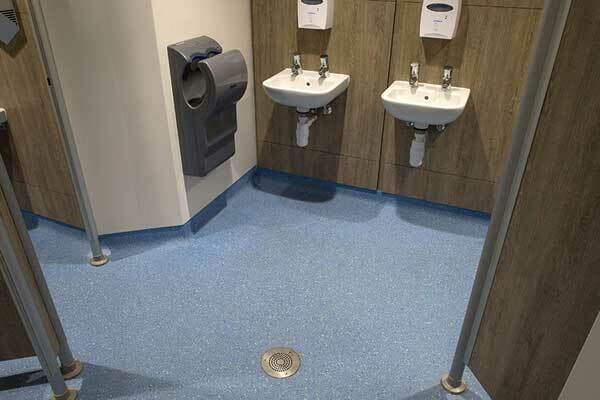 Our range includes Altro, Forbo, Polyflor, Gerfloor and Tarkett UK – all of which are renowned for designing easy clean, long lasting and anti-bacterial wet room flooring. Your bathroom will be better protected against water and staining than it would be if fitted with laminate, wood or carpet. S&G Carpets regularly provide Wet Room flooring to domestic and commercial clients across Devon and North Cornwall, including Bideford, Barnstaple, Torrington, South Molton and Bude. To view our range and discuss your options with a trained advisor, visit our showroom in Torrington, or alternatively arrange a home visit by either calling us on 01805 623112 or completing our enquiry form. We'll come to you free of charge to measure up and provide estimates, we'll also bring samples with us for you to see how different colours will work in your bathroom.